Fort William Mum, Mandy Watson, decided things needed to change. Her son started biking nearly 2 years ago and Aidan would go off riding with his Dad while Mandy sat in the café waiting for them to come back. “To be honest I did not really enjoy cycling as I was always the one dying at the back” said Mandy. Mandy’s other reason for considering an electric bike was to address the Fort William traffic problem. Mandy was sick of sitting in traffic jams for short journeys which she thought might be quicker by bike. 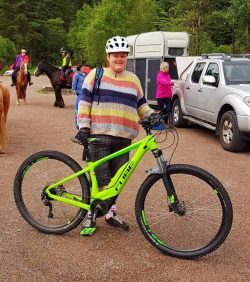 With encouragement from her boys Mandy chose a Cube Electric bike and we asked her how she was getting on and which journeys she used the bike for. “Yes I do take the bike to work some days. It’s about 1 mile to work and back. I also use it to visit the horses up at Torlundy which is around 3 or 4 miles. 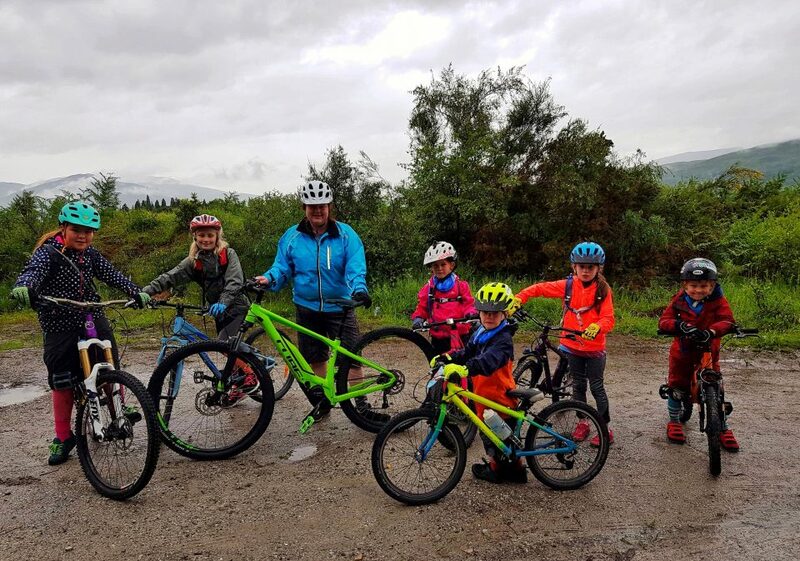 At the weekends, instead of sitting in the café, she is out helping with the younger bikers at the local bike club the West Highland Wheelers. “I have had so much fun with this e-bike. I have done so much more than I thought I could do. For me it makes cycling enjoyable. We asked Mandy what her favourite bit about owning an e-bike. “Getting out and enjoying so much more time with family and friends, keeping up with my 8 year old child and generally doing stuff I would never have thought I would. Would you recommend buying one? 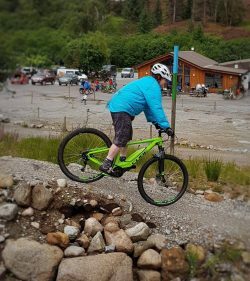 Mandy chose a Cube Acid Hybrid One 400 which is ideal for tracks in and around Fort William. If you are interested in finding out more about electric bikes or would like to try one Off Beat Bikes have a selection in the shop. Get in touch, call us on 01397 704008, email info@offbeatbikes.co.uk or message us Facebook.